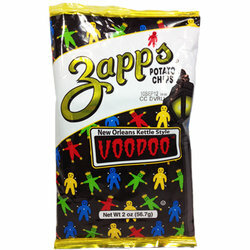 Zapp's Voodoo Potato Chips. New Orleans Kettle Style Potato Chips. A unique flavor developed by accident. The flavor is a combination of about 5 different flavors that result in this great taste. Each bag is 1.5 oz. Try some today!